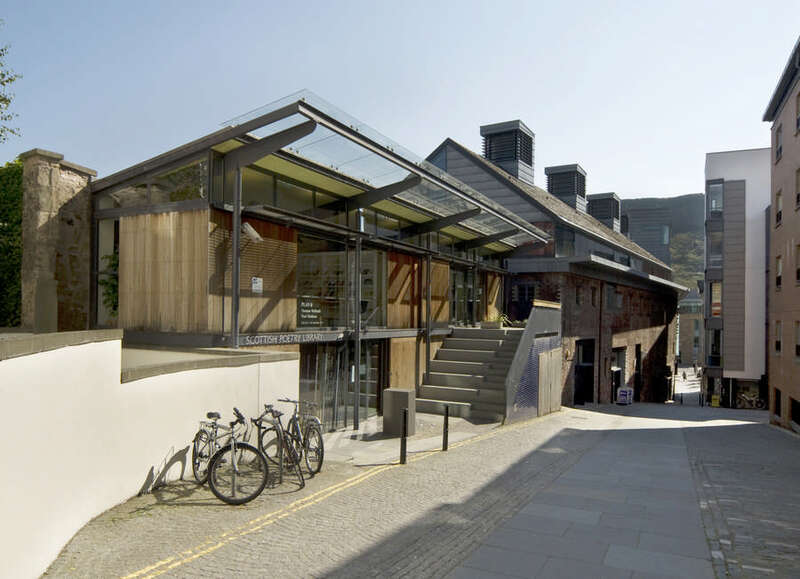 Malcolm Fraser Architects have completed up to Stage D proposals for the Scottish Storytelling Centre having won the commission through competitive interview. 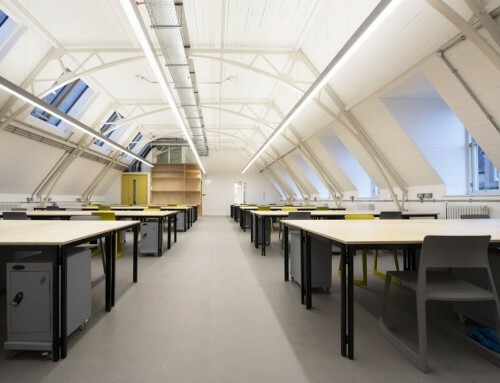 The short-listed practises were Dearle and Henderson, Elder and Cannon, and Richard Murphy Architects. The contract value is £2.3 m with principal funding by the Church of Scotland; an application for part funding has been submitted to the Scottish Arts Council National Lottery Fund. Funding confirmation was due in Sep 2001. 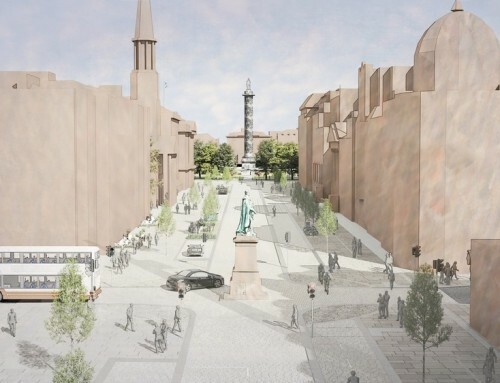 At the heart of the built part of this proposal is the Storytelling Court. In adapting the existing Netherbow Arts Centre (built in 1970 next to, and incorporating, the 16thC. John Knox House, at the foot of Edinburgh’s High Street) it was necessary to provide a place of welcome and a heart to the centre. 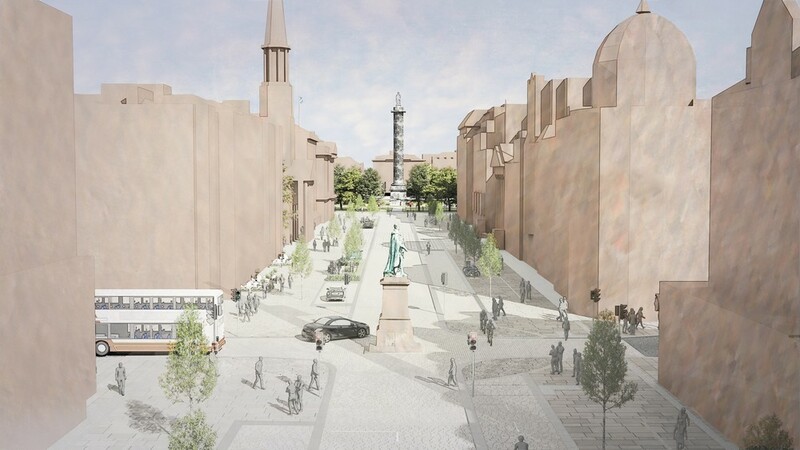 The proposal encloses an underused external courtyard in a double-height space and, having made the enclosure, opens it up again to its immediate context: the Royal Mile, the existing Garden to the rear, and the sky. Large rooflights let sun enter, while deep white fins between them reflect it back into the enclosed Court as a wash of diffused light. The end wall of the Court mirrors the great rooflight with a huge window, which overlooks Hope’s Court Garden to the rear (This urban garden was created in 1999 by landscape architects Turnbull Jeffrey, whose office lies to its north. 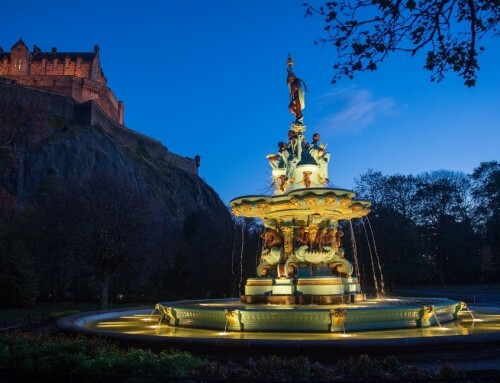 It is one of only two public gardens within the Old Town of Edinburgh and is particularly configured to serve the Storytelling Centre: its variety of circular walls, benches and seats perfectly suits outdoor storytelling gatherings). The window provides the simplest and most generous form of linking Court to Garden. Its huge, pivoting sash will, when opened, pull the garden right into the Court, underlining its semi-outdoor nature. 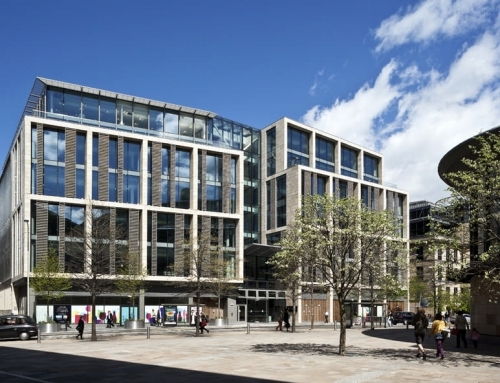 The court is open towards the High Street, extending through the existing building to a new, large street window overlooking the Royal Mile, connecting the Storytelling Court to the City. Here the myriad existing building levels are gathered onto one access level which links the Court through a new opened up existing archway to the main Storytelling Centre entry at John Knox House. Adjacent, sitting behind the street window, is the café and refreshment bar, this most public part of the Court demonstrating the idea of hospitality within storytelling (in Gaelic the ceilidh is seen as art and hospitality combined). For functions it can service the main Court or, with partitions closed to form a discrete venue within the Court, act as foyer and bar. The Storytelling Court – intimately woven into its physical context – is equally connected to the wider storytelling network. The Court is a venue for performance and gathering, but it is also a tour guide to stories, local, national, worldwide and beyond. It does this by means of the ‘Wall of Stories’ which explores the artform through visual, tactile, virtual and audio means, with sections developed by artists, storytellers and web designers. It will contain displayed objects which generate stories, facilities where users can tell, record and send stories across the web, and interactive digital ‘mapping’ media which explore immediate or far-flung environments through stories. (The world wide web has been seen as many things, but the simple view of it as a network of stories is particularly clear and resonant.) These elements then move aside to reveal a stage, with the possibility of further articulation creating intimate places for storytelling. The proposals include a multi-purpose performance space directly below the Storytelling Court. This will be a substantial refit of the existing venue, which raises the capacity from 75 to 98, replaces the fixed seating with moveable bleachers for flexible staging configurations, and brings lighting, sound, acoustics, control booth, noise breakout and backstage facilities up to modern, best practice standards, within the constraints of the existing site. The Auditorium too has its visual connection to the Storytelling Garden, a smaller window which can be shuttered off to achieve full black out. Above the Storytelling Court, at first floor level, is the Education and Resource Room, with its library and reading / viewing area. It is fully equipped to host seminars and events in general that are less public than those in the Court below. 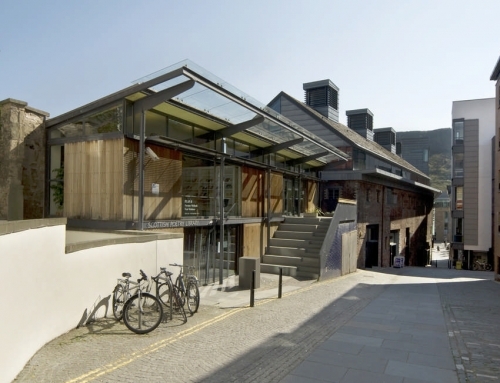 It is intended that the remodelled Scottish Storytelling Centre will help to re-establish a sense of gateway and urban compression at the High Street. 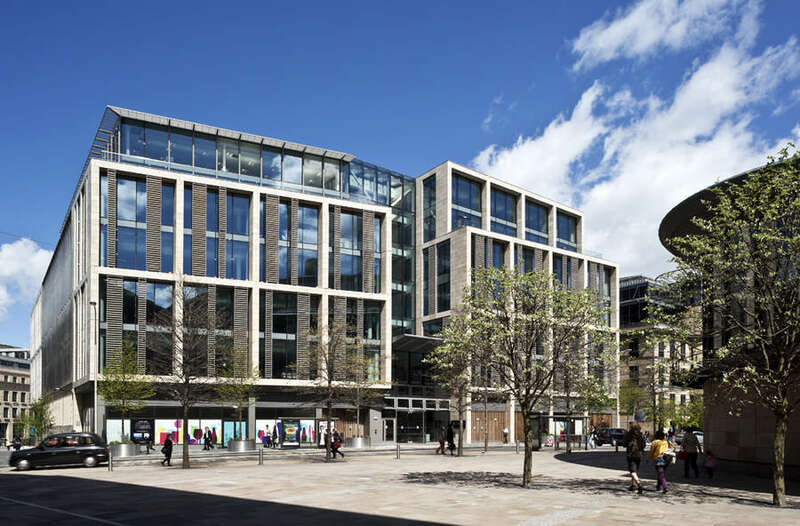 Compression is regained by the articulation of a forestair and canopy, which re-establishes the original building line without regenerating traffic congestion. The sense of gateway is added by the replacement of the existing gable stair tower with a belltower. This tower re-presents the original city bell, cast in 1621 and formerly hung in the Netherbow Port. The bell in its tower is a particularly strong image for storytelling: broadcasting station, receptor, town cryer. The bell is inscribed in Latin and Scots with mottoes and stories, as is John Knox House and retained plaques from the Netherbow Port. All these will be re-presented within the tower alongside new inscriptions commissioned from contemporary artists and carvers. The historic and cultural resonances of the regained urban Gateway echo those of the Storytelling Court, where storytelling through physical gathering and electronic networking acts as Gateway to our history and culture.